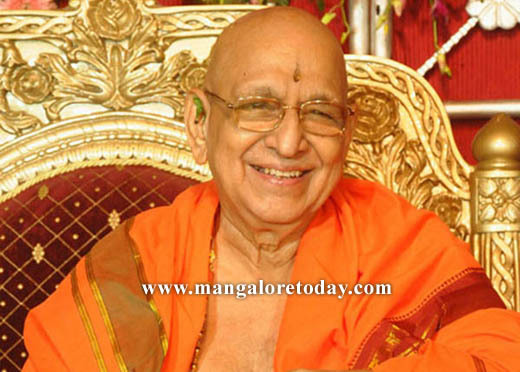 Mangaluru, Mar 31, 2015: Navati or 90th (Birth) Janma Mahotsava of Varanasi Shree Kashi Mutt Samsthanam seer H H Shrimad Sudhindra Tirtha Swamiji will be celebrated at Sri Vyasashram, Haridwar from April 1 to April 6. Dinesh Kamath, the Navati Mahotsava Committee Joint Treasurer said that celebrations will begin with religious observations. Shrimad Sudhindra Tirtha Swami would release a book called ’Sri Guru Darshanam’ on April 6. The 300 page work is a unique collection of around 800 photographs of the seer from his childhood to the present. Along with this, an exhibition of around 1,000 rare photos will be held at Sri Vishwanatha auditorium of Sri Vyasashram, he said. From Dakshina Kannada and Udupi districts, about 1100 devotees of GSB Konkani communities would travel to Haridhwar in two special trains. Around 3,000 rooms have been booked there for accommodation. Devotees would use three special trains from Mumbai and one from Kochi. Around 6,000 community people are expected to participate in the programme. People around the globe can watch the live telecast of the happenings on www.kashimath.in, from April 4. Meanwhile, he said that special religious rituals will be held in more than 180 GSB temples on April 6 in many places.